ST. GEORGE — With more than two weeks of preseason play now under their belts, the boys basketball teams of Region 9 have less than one week until regular season play starts on Dec. 19. Following are short recaps on how each team has fared thus far, along with a look ahead to next week and beyond. The Dixie Flyers have won all four of their preseason games to date, starting with wins over Stansbury and Tooele at the Central Utah Preview tournament in Richfield Nov. 30 and Dec. 1. In the Stansbury game, the Flyers came from behind in the fourth quarter to win 48-46. Hayden Cottle led Dixie with 13 points, while Isaac Finlinson and Jordan Mathews each added 11. The following day, the Flyers had an easier time against Tooele, defeating the Buffaloes 72-52. Finlinson led the way with 21 points, while Cottle added 18 points and 10 rebounds. The following weekend, Dixie hosted the Ken Robinson Classic. On Friday, Dixie edged past Centennial, Nevada, 58-56. Cottle was the leading scorer with 19. Then on the next day, the Flyers outscored Spanish Fork by nine points in the fourth period to finish with a 61-57 victory. Nic Roundy led Dixie with 18 points, with Cottle adding 15. Following an upcoming nonregion home contest at noon Saturday against Green Valley, Nevada, the Flyers will open their Region 9 slate Wednesday at Cedar at 7 p.m. They’ll play at a couple holiday tournaments during the year-end break, after which Dixie’s second region contest will be at home against Snow Canyon on Jan. 9. The Warriors are 3-2 so far during the preseason, including going 1-2 at the Juniper Ridge North vs. South invitational tournament hosted by Snow Canyon Dec. 6-8. The Warriors opened the three-day tournament with a 52-50 win over Mountain Crest. Cole Warner and Joey Robertson scored 13 points apiece for Snow Canyon, while McKay Meacham added 12. Friday’s game against Ridgeline, the Warriors lost 60-58, with Ridgeline’s Landon Brenchley pouring in 34 points. Warner had 17 and Robertson scored 16 for the Warriors in the loss. Snow Canyon fell again Saturday to Sky View by a score of 69-52, with Warner’s 18 points leading the way for the Warriors. 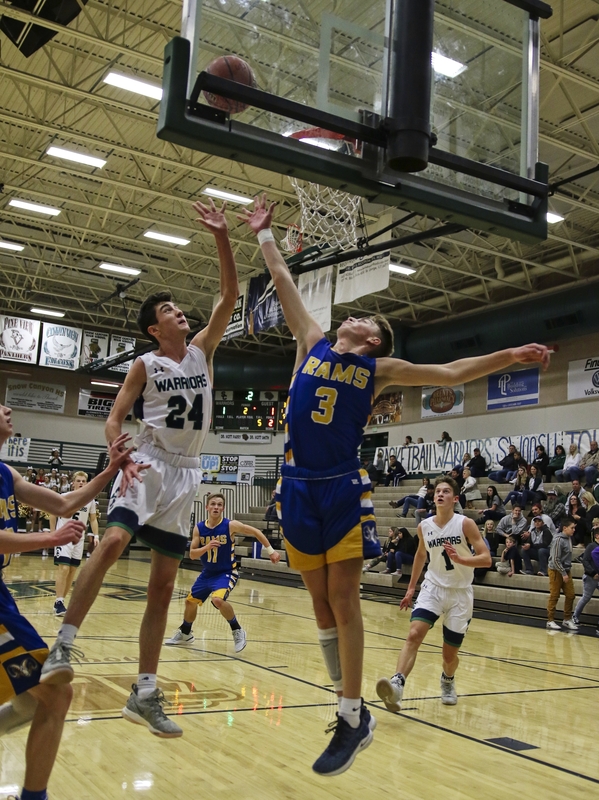 Wednesday night, Snow Canyon hosted 2A’s Parowan Rams, with the Warriors pulling away in the final quarter for a 48-42 victory. 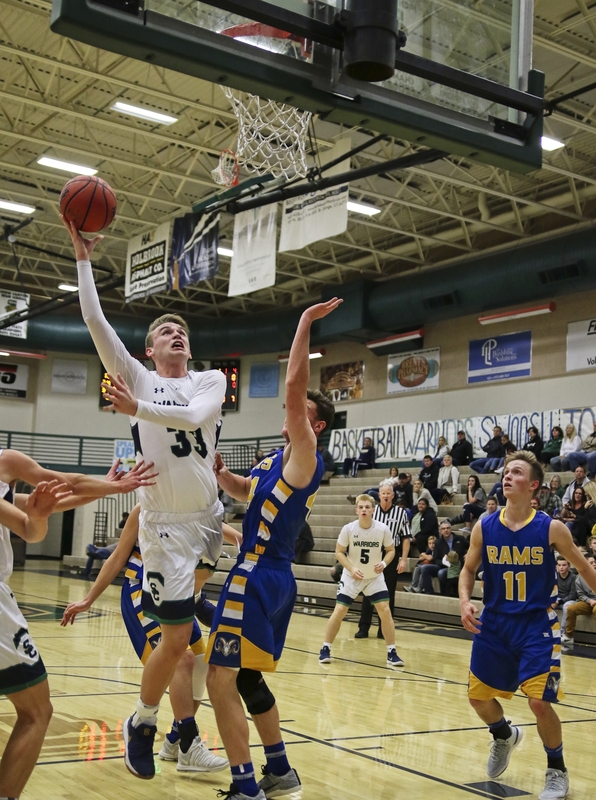 Jacob Dunkley led Snow Canyon’s balanced attack with 13 points, countering a 28-point effort by Parowan’s Porter Wood. This week, Snow Canyon hosts Richfield 7 p.m. Friday. The Warriors will begin Region 9 play next Wednesday at Canyon View at 7 p.m. The Desert Hills Thunder are off to a 3-1 start in preseason play. Desert Hills won both of their games at the Central Utah Preview tournament in Richfield, beating Richfield 55-45 on Nov. 30 and defeating Stansbury 71-37 on Dec. 1. Carson Thornton was the Thunder’s top scorer in the first game with 11 points. Against Stansbury, Keegan Munson and Trevin Lindstrom scored 14 points apiece, while Thornton added 10. The following weekend at the Ken Robinson Classic hosted by Dixie High, the Thunder defeated Spanish Fork 74-63 on Friday. Thornton paced Desert Hills with 22 points, with Mason Chase adding 14 and Alex Sampson contributing 13. On Saturday, however, the Thunder were dealt their first loss of the season at the hands of Centennial, Nevada, which rolled to a 69-49 victory. Lindstrom scored 13 to lead Desert Hills in that contest. The Thunder will open the regular season at home Wednesday against Hurricane at 7 p.m.
Over the holiday break, Desert Hills is scheduled to play in the Coach Walker Holiday Classic in St. George Dec. 20-21, as well as in the Utah Autism Holiday Classic in the Salt Lake area Dec. 27-29. After opening the year with four straight losses, the Cedar Redmen have won their last two contests to bring their preseason record to 2-4. After losing the Nov. 21 home opener to Cottonwood, the Redmen dropped three games at an invitational tournament Nov. 29-Dec. 1 at Corner Canyon High School in Draper, losing to Corner Canyon, Syracuse and Lehi on successive days. On Dec. 4, Cedar picked up its first win with a 60-47 home victory over Enterprise. Treyton Tebbs scored 21 points to lead Cedar and Tanner Eyre added 15, with each of them making four 3-pointers. The Redmen hosted Lincoln County, Nevada, on Wednesday night, with Cedar defeating the Lynx 80-54. Tebbs scored 24 to lead Cedar, while teammate Zab Santana added 22. This weekend, Cedar will compete in the Blue and Gold Tournament at Enterprise, with the Redmen scheduled to play Rockwell Friday at 5:30 p.m. and either Altamont or Enterprise Saturday at noon. Cedar’s first Region 9 game of the season will be at home at 7 p.m. on Wednesday against the Dixie Flyers. The Canyon View Falcons are 2-4 in preseason action. The Falcons posted their first win on Dec. 1 at the Central Utah Preview in Richfield, where they defeated North Sevier 74-50. Parker Holmes paced Canyon View with 15 points, while Mason Lyman added 14 and Trevor Farrow contributed 13. The following weekend, Canyon View took part in the Juniper Ridge North vs. South invitational tournament hosted by Snow Canyon. Canyon View lost to Sky View 76-67 on Dec. 6, then fell to Mountain Crest 60-53 the following day. The Falcons bounced back Saturday with a 70-68 win over Ridgeline. Farrow led all scorers with 31 points, including five 3-pointers. After hosting South Sevier in an upcoming nonregion game Friday at 7 p.m., the Falcons will open Region 9 play next Wednesday when they host Snow Canyon at 7 p.m. The Hurricane Tigers are off to a 4-2 start in the preseason. Hurricane won one of two games at the Central Utah Preview in Richfield, beating North Sevier 59-46 on Nov. 30. The following day, the Tigers lost to South Sevier by one point, 36-35. Matt Meyers led the Tigers with 17 points in the win over North Sevier, while TJ Minor added 15. The following week, Hurricane traveled to Page, Arizona to participate in a three-day tournament there. On Dec. 6, the Tigers fell to Valley Christian, a private high school from Chandler, Arizona, by a score of 52-42. Hurricane bounced back big on Friday with a convincing 63-18 victory over El Capitan, Arizona. Hurricane started the game with a 23-2 run and coasted from there. Eleven different Tigers made it into the scoring column, led by Brandon Langston’s 15 points. Hurricane rolled to its second straight blowout win Saturday when they defeated Monument Valley, Arizona 72-34 to wrap up the Page tournament. Daxton Dayley lead the Tigers with 19 points. This week, Hurricane hosted Richfield on Wednesday night, with the Tigers coming out on top with a dramatic 48-47 victory. Trailing by one point in the final seconds, Hurricane’s Bryce Thomas got fouled by Richfield with 2.5 seconds remaining. Thomas then made both of the ensuing free throws to win the game, head coach Todd Langston reported. Thomas finished with a game-high 14 points, while Meyers added 13. Also this week, the Tigers are scheduled to travel to Draper to play Juan Diego Catholic High School on Friday at 7 p.m.
Then, next Wednesday, Dec. 19, Hurricane will open its Region 9 regular season schedule at Desert Hills High at 7 p.m. The Pine View Panthers are 2-3 in preseason play, having first split a pair of games at the Central Utah Preview in Richfield Nov. 30 and Dec. 1. After dropping a 59-56 contest against Tooele on Friday, the Panthers bounced back with a 52-47 win over Juab the next day. The following week, Pine View participated in the three-day Juniper Ridge North vs. South invitational tournament hosted by Snow Canyon. The Panthers lost to Ridgeline 85-74 on Dec. 6, then fell to Sky View 76-67 the following night. Sky View had beaten Canyon View by that exact same score the previous evening. Saturday, Pine View posted a 64-52 win over Mountain Crest, thanks to fourth-quarter surge during which the Panthers outscored the Mustangs 28-14 over the last eight minutes of the game. Michael Moore scored 18 points to lead Pine View, while Taiven Shepherd added 14 points and grabbed a team-high seven rebounds. This Saturday, the Panthers host Richfield at 7 p.m. Although the regular season starts for the other six teams in Region 9 next week, the Panthers have a bye and won’t play a region game until they visit Snow Canyon on Jan. 4. In the meantime, Pine View will play four games in three days as part of the Coach Darin Walker Classic tournament scheduled to take place in St. George Dec. 20-22.